Rep. Patrick Abrami, R-Stratham, speaks in favor of a proposed constitutional amendment to prohibit an income tax in a House session Tuesday. CONCORD — First Keno and now betting on sporting events. The House Tuesday approved sports betting after the US Supreme Court opened the door last year to the once illicit activity. 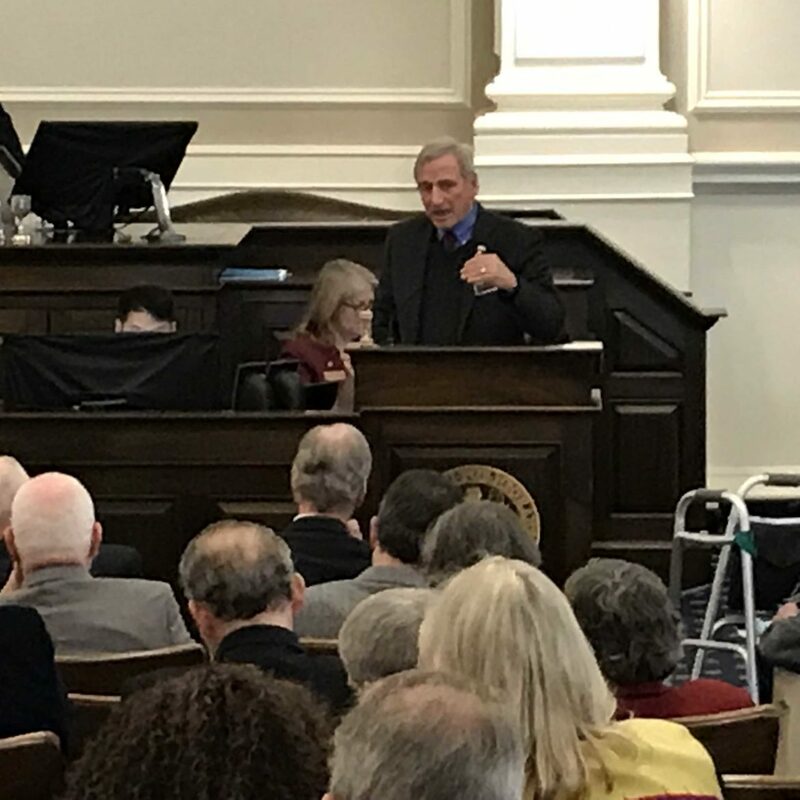 Approved by a 269-82 vote, House Bill 480 would allow up to 10 betting locations throughout the state, but would prohibit wagering on high school games and on New Hampshire college and university teams. The proposal is projected to produce up to $10 million in revenue during the first year, according to the Lottery Commission, which would oversee the operation. He said across the nation illegal sports betting is estimated to top $150 billion annually in the black market. But opponents said while the revenue is attractive there will be unintended consequences down the road. The US Supreme Court last year ruled in Murphy vs. National Collegiate Athletic Association the federal law prohibiting states from allowing betting on professional and amateur sports was unconstitutional opening the door for states to allow betting on sporting events. The bill limits betting to individuals at least 18 years old and would allow mobile betting from cell phones or other mobile devices. However, the person making the bet would have to be in New Hampshire when it is made. Communities would have to vote to allow one of the 10 betting stations within their boundaries. Under the House bill, 10 percent of the state’s share of the revenue would go to the Responsible Gambling Commission to generate treatment and prevention programs. House budget writers are expected to include the revenue in its proposed budget to be decided next month. HB 480 goes to the Senate for consideration. The House did not vote directly on a bill that would discontinue a pet program of Republicans, allowing businesses to donate to an education scholarship program for middle- and low-income students in return for a tax credit against their business tax liability. Instead, the House voted 232-19 to table the measure. House Majority Leader Douglas Ley, D-Jaffrey, noted the controversial aspect of the bill in asking the House to table the measure. “The interests of our children would be better served to set aside (this bill) and to explore better alternatives,” he told the House. The bill could be removed from the table on a majority vote, but after Thursday, it would require a two-thirds majority to pass because it is after the deadline for acting on bills not in a second committee. The Education Tax Credit scholarship program allows students to attend private and religious schools and may be used to cover the cost of home schooling. The program was challenged and was declared unconstitutional by Strafford County Superior Court because public money would be used to pay for religious schools, but that decision was overturned by the state Supreme Court on a technicality. Scholarship supporters say the program allows parents to find the best educational fit for their children and offers alternatives to public schools. Program supporters wearing yellow scarfs greeted legislators Tuesday morning outside the State House. Some House members wore yellow scarfs during the session. But supporters of House Bill 632, which would end the program, say it is an inappropriate use of public money as a vast majority of the scholarship money goes to religious schools. The House approved two bills intended to reduce plastics and sent them to the Senate. House Bill 558 would prohibit automatically giving a person a plastic straw with a drink. A person would be able to ask for a straw under the bill. Supporters said the use of plastics has harmed both the environment and wildlife and the ban would be a first step. But opponents suggest New Hampshire’s action would have little impact and would harm people who need straws to drink. The bill passed on a 196-146 vote. House Bill 560 would prohibit stores from distributing single-use bags at checkouts both plastic and paper. Under the bill, if a customer requests a bag, he or she would be charged 10 cents. Opponents say the impact on small businesses would be severe when a study would allow more time to find an effective solution. But supporters say the damage from plastics bags is well known, has costs municipalities millions of dollars, and bans are effective in Europe and in neighboring Massachusetts. The bill was approved on a 201-145 vote. House Bill 233, which places many of the provisions of the Affordable Care Act into state law, such as essential health benefits, prohibiting insurers from denying coverage for preexisting conditions, and premium restrictions for age and lifetime caps. The bill was approved on a 207-140 vote. House Bill 277, which would establish a commission to study a public option for health insurance. The bill passed on a 211-141 vote. House Bill 657, which allows an individual to continue using a low-cost drug when his or her health insurer removes the drug from its formulary. House Bill 224, which makes emergency medical technicians and rescue squad members eligible for a death benefit. House Bill 494, which would require the state to require the Coakley Landfill site be cleaned of pollutants. The House approved the bill on a 230-98 vote. House Bill 737, which establishes a commission to investigate and analyze the environmental and public health impacts of perfluorinated chemicals in the air, soil and groundwater of Merrimack, Bedford and Litchfield. House Bill 118, which would require a child’s primary health care provider be notified about a report of child abuse. House Bill 520, which would require new commercial buildings to have at least one diaper changing station available to all genders. The requirement would also apply for renovations over $50,000. The bill was approved on a 206-142 vote. House Bill 628, would require new construction of building over 40,000 square feet and have 1,500 customers or more a day, to have a universal changing station in a family restroom for the disabled. The bill passed on a 211-133 vote. House Bill 700, established a methodology for assessing utility property for all communities. CACR 12, a proposed constitutional amendment to prohibit an income tax in the state. It was killed on a 206-143 vote. House Bill 676, which would have eliminated the statewide education property tax and replaced it with other state revenues. The bill was killed on a 321-32 vote. The House meets again Wednesday beginning at 10 a.m. as it faces a deadline to finish work on its bills.